Israeli and Hamas negotiators announced an unconditional 72-hour humanitarian cease fire in Gaza, effective from 8am Gaza time Friday. While Israeli forces will remain in Gaza during the ceasefire, both sides have agreed to continue negotiations in Egypt with the goal of reaching a “durable ceasefire.” Two Israeli civilians and 61 Israeli soldiers have been killed in the fighting on the Israeli side. Almost 1,500 Palestinians—mostly civilians—have been killed in Gaza. Previous efforts to establish a lasting ceasefire have been unsuccessful. Do you think that this effort will be more successful in establishing a lasting truce in Gaza? Why? What conditions are necessary to establish a lasting peace between Israel and Palestine in the Middle East? Were the Tel Aviv Flight Restrictions an Embargo? American and European aviation authorities yesterday issued a directive ordering US and European airlines not to fly to Israel’s David Ben Gurion Airport in Tel Aviv. The order was issued after a rocket launched from Gaza landed less than a mile from the airport. Less than a day later, the flight restriction has been lifted. According to some, the Federal Aviation Administration was acting out of an abundance of caution after the downing of the Malaysian Airlines flight by pro-Russian separatists operating in eastern Ukraine. But many critics argued that the flight restrictions represented an effort by the Obama Administration to impose an embargo against Israel. In foreign policy, embargos represent an effort to isolate another country, usually in response to actions to which a country objects. The United States maintains embargos (usually limited to arms and military technology, but sometimes much broader) against 6 countries today. Those against Sudan, Iran, North Korea, Cuba, and Syria, are widely publicized. However, the United States continues to maintain an arms embargo against China, imposed in the aftermath of the Tiananmen Square indictments of 1989. Embargoes are generally most effective when they are widely enforced by many countries, and because they are diplomatic initiatives, they are generally widely publicized to show a country is taking action. What do you think? Were the FAA flight restrictions intended to serve as an informal embargo against Israel by the United States? If so, why was the embargo not publicized like most embargoes before it? Could an embargo affect Israel’s military intervention in Gaza? Why? 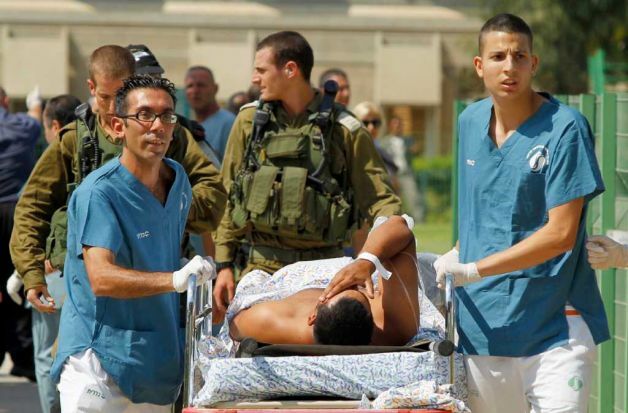 Israeli medics evacuate a person injured in the attacks of August 18. Thursday’s deadly attacks on Israeli civilians, allegedly perpetrated by militants from Gaza, illustrate the limits of deterrence. Deterrence involves the use of threats to prevent undesired actions. Deterrence threats take the form “don’t do X, or else,” where X is the undesired action and the “or else” is the threatened punishment. Israel has relied on the threat of costly retaliation to prevent militants in Gaza from attacking Israelis, but recent changes in the security environment have made these deterrence efforts much more difficult. Specifically, the chaos in post-Mubarak Egypt has reduced Egypt’s ability or willingness to police the Sinai Peninsula, opening up a vast new territory from which Gazans (who can easily escape Gaza through tunnels into Egypt) can attack Israel. This problem of identification and accountability is the reason why some scholars and policymakers, particularly since 9/11, have concluded that we cannot rely on deterrence to prevent states from giving weapons of mass destruction to non-state, terrorist organizations. That is, if a state’s leaders believe the weapons it gives to terrorists can’t be traced back to the source, they will not be deterred from doing so. This, of course, is a key argument in support of preventive war, as articulated by the Bush administration after the 9/11 attacks. Preventive war involves striking an enemy (or potential adversary) before the threat has fully materialized. What other factors besides the problem of identification/accountability may undermine efforts to deter unwanted behavior in world politics? Is there any way to overcome these problems? When deterrence cannot be achieved, is preventive war the answer? With the Congress in recess, the U.S. political scene has been dominated by coverage of town hall debates over health care reform. In the debate, the British National Health System (NHS) has been trotted out as representative of the dangers of government-run health care, charges to which the British government has responded. The Financial Times on Friday offered a balanced comparison of the U.S. and British health care systems, which debunks the selective use of statistics in the current debate. 1. The Taliban has stepped up attacks in Afghanistan ahead of nation-wide elections scheduled for Thursday. On Saturday, the Taliban launched a suicide bomb attack against NATO’s heavily fortified Afghanistan headquarters in Kabul, killing eight and wounding nearly 100 people. With observers already worried about the ability of the Afghan government and international elections monitors to conduct a nation-wide poll in the country, observers fear that the Taliban may attempt to disrupt the elections. The relative period of peace which had preceded Saturday’s attack had led some to believe that the Taliban would allow the elections to take place. Thursday’s poll will pit incumbent President Hamid Karzai against former foreign minister Abdullah Abdullah. Although many observers believed Karzai’s campaign enjoyed an insurmountable advantage, Abdullah’s campaign has managed to close the gap, and some are now forecasting the need for a run-off election in October. A runoff would be necessary if neither candidate manages to secure an absolute majority of the vote. 2. Palestinian authorities in Gaza engaged in a series of small battles against Jund Ansar Allah, on Friday. The shootouts resulted in at least 13 deaths and dozens wounded. The battles represented the latest—and perhaps most serious—challenge to the Hamas-led government in Gaza. Jund Ansar Allah is one of several small extremist groups pushing for the introduction of strict Sharia law in Gaza. Jund Ansar Allah, which claims ties to al-Qaeda, had labeled Gaza an Islamic emirate subject to theocratic law, a claim which Hamas rejects. For its part, the Hamas government has dismissed challenges to its leadership as “Zionist propaganda” sponsored by the Israeli government. 3. The French Minister for Urban Regeneration, Fadela Amara, sparked a national debate last week when she called for a nation-wide ban on wearing the burka in France. Amara, a French national of Algerian decent, said that the burka represents “the oppression of women, their enslavement, their humiliation.” Banning the burka, she said, must be part of a broader effort to welcome moderate Islam while fighting the “gangrene, the cancer of radical Islam which completely distorts the message of Islam.” Amara’s comments are part of a broader debate in France. The national parliament in July established a committee to determine whether the wearing of the burka is “compatible with France’s republican tradition of equality between men and women,” and French President Nicolas Sarkozy in June said the burka “will not be welcome on the territory of the republic.” An estimated 5-10 percent of the French population is Muslim, though only a few thousand wear the burka. 4. South Korean President Lee Myung-bak last week attempted to re-open talks with North Korea, offering to negotiate troop reductions along the border between the two countries. The border between North and South Korea is among the most militarized in the world, with more than one million troops, including 30,000 U.S. troops, based in the area. However, in his offer, Lee reiterated the South Korean position that a comprehensive peace deal between the two countries would be predicated on North Korea abandoning its nuclear efforts, a proposition with the North has consistently rejected in the past. 5. Continuing her Africa tour with visits to Nigeria and the Democratic Republic of the Congo last week, U.S. Secretary of State Hillary Clinton spoke out on several of the continent’s hot spots. Last week, she urged political reconciliation in Kenya and offered support for Somali efforts to fight piracy and Islamic extremism, During her tour, she has not shied away from provoking controversy. In Nigeria, she criticized “the lack of transparency and accountability [which] has eroded the legitimacy of the government.” She also called for African governments to toughen their stance on Robert Mugabe’s government in Zimbabwe. 1. In the first major foreign policy speech of the Obama administration, Vice President Joe Biden proposed to “press the reset button” on relations with Russia, noting that despite policy differences in many areas, the U.S. and Russia could still work together on areas of mutual interest and concern. The conciliatory tone did not include a review of the U.S. missile defense system, which has angered Russia. In recent weeks, the Russian government has announced a series of initiatives, including plans to establish naval and air bases in Abkhazia, an air defense treaty with Belarus, and a collective security organization which includes many of the former Soviet republics. 2. A Pakistani court last week released Abdyl Qadeer Khan from house arrest. Khan is the nuclear scientist responsible for the development of Pakistan’s nuclear capabilities. He is also believed to have played a key role in the proliferation of nuclear equipment and know-how to North Korea, Iran, and Libya. Khan’s role in the Pakistani nuclear program made him a national hero, and many Pakistanis believe the evidence against him was fabricated. But under threat of sanctions, the Pakistani government placed Khan under house arrest five years ago. His release was greeted by disappointment from the United States and France. Despite the move, Pakistan is still hoping to woo more aid from—and potentially a closer relationship with—the United States. 3. With elections for the Israeli Knesset scheduled for Tuesday, polling over the weekend suggested the race would be much closer than anticipated. Early polling had suggested that the center-right Likud party would cruise to an easy victory, as most Israelis were identifying security as their primary concern and Likud was seen as strong on security. But recent polling data suggests that neither Likud nor the center-left opposition Kadima party will win a majority, forcing either to enter into negotiations with minority parties to form a government. Meanwhile, polls from Gaza show a sharp spike in support for Hamas following Israel’s three-week military offensive in the Palestinian territory, suggesting that Hamas may actually have been strengthened by the campaign. 4. The longstanding drought in Argentina continues. The drought, the worst in nearly fifty years, threatens the collapse of Argentina’s agricultural exports. As one of the world’s second largest exporter of agricultural commodities and livestock, the projected collapse of exports from Argentina threaten global food supplies. World food prices had declined form their record highs set in 2007-08 in part on projections of increased production from Argentina. Global market prices for rice, wheat, and soy have already increased 20 percent in the last two months, and with declines now projected for Argentina’s wheat, corn, and soy output, world prices are projected to continue to increase. In an unrelated development, the Chinese government declared an emergency in response to drought conditions in central and northern China. The Chinese drought undermined wheat production. 5. Relations between British Prime Minister Gordon Brown and French President Nicolas Sarkozy stumbled late last week after Sarkozy declared that Brown’s proposal to temporarily cut the value-added tax in an attempt to stimulate the economy would have “absolutely no impact,” arguing that Britain “doesn’t have any industry left” and its banks were “close to ruin.” Brown is already facing strong domestic opposition from the opposition Conservative Party, whose leader, David Cameron, sized on the French president’s comments. The annual meeting of the World Economic Forum took place in Davos, Switzerland, over the weekend. The forum is intended to provide world economic leaders an opportunity to meet to discuss issues of global importance. The meeting is normally incredibly cordial, as the economic focus of the conference provides an opportunity to move beyond traditional political wrangling that characterizes official meetings of heads of state. This year, however, the Gaza crisis prompted the Turkish prime minister to leave the meting in protest and tension filled the air. In general, this year’s forum has been dominated by discussion of the global economic crisis British Prime Minister Gordon Brown warned against a rising tide of protectionism similar to the trend that occurred leading into the Great Depression, while bankers cautioned the U.S. government against political interference in banking operations. 1. Provincial elections in Iraq on Saturday were generally peaceful. Although the final tally will take more than two weeks to complete, preliminary results indicate voter turnout was 51 percent, a slight decline from 2005. Turnout in Sunni provinces, which had previously dismissed the electoral process as biased against their interests, was particularly high. With more than 14,000 candidates competing for just 440 seats, there are bound to be a large number of disappointed political parties and candidates. The question that worries observers now is: how do those who lose the vote respond? 2. A last-ditch effort to craft a government of national unity in Zimbabwe appears to have been successful, as Morgan Tsvangirai’s Movement for Democratic Change agreed on Friday to join Robert Mugabe’s ruling Zimbabwe African National Union, Popular Front to govern the country. Once one of the wealthiest and most productive countries in the region, Zimbabwe has gradually collapsed into economic chaos. With the unemployment rate at an estimated 95 percent, the World Food Programme estimates that up to 70 percent of the country’s population may require food aid in the next six months. In an effort to deal with the crisis and bring the country’s rampant inflation—currently believed to be running as high as a quadrillion percent (that’s 1,000,000,000,000,000%, incase you’re wondering) under control, the government last week also removed restrictions on using foreign currencies for economic transactions within Zimbabwe. It is now possible—indeed likely—that bread, gas, and other basic commodities will be priced in U.S. dollars, pound sterling, South African rand, or other foreign currencies. 3. The crisis over the future of South Ossetia and Abkhazia, which was at the heart of a diplomatic standoff between the United States and Russia lat year, has once again reemerged on the international stage. Russia has announced plans to construct a new naval base in Abkhazia, a move which Georgia claims will undermine its national sovereignty. Meanwhile, in an apparent overture to the west, Russia has suspended plans to deploy a missile station in Kaliningrad. Russia had announced its intention to deploy cruise missile batteries in the enclave last year after the United States moved forward with plans to deploy its missile defense shield in Eastern Europe. 4. The Mexican government announced on Tuesday that the country is likely headed into recession, with the economy estimated to contract by as much as 1.8 percent in 2009. The Mexican economy is heavily dependent on exports to the Untied States, with exports to the U.S. accounting for 80 percent of all Mexican exports and representing about 25 percent of all economic activity in the country. Already, Mexico’s central bank has cut interest rates in an attempt to stimulate the domestic economy. Meanwhile, an ongoing conflict between powerful drug cartels and the central government has led some analysts to forecast that Mexico could achieve “failed state” status if it is unable to assert control over the cartels. 5. Although the fragile ceasefire in Gaza has officially held, a number of fractures are beginning to appear. On Thursday, Hamas launched rockets into Israel in response to an Israeli airstrike against a suspected arms factory in Gaza on Wednesday. President Barack Obama named George Mitchell his Middle East envoy, and Mitchell appears to have his work cut out for him. Arab states are demanding an investigation into alleged war crimes committed by Israel during the conflict in which more than 1,300 Palestinians were killed and more than 5,000 were injured. 6. A moderate Islamist leader, Sheikh Sharif Ahmed, was declared the winner of Saturday’s presidential elections in Somalia. Ahmed was the head of the country’s sharia court system that brought stability to southern Somalia in 2006. But the withdrawal of Ethiopian troops earlier this year has led to even more instability in Somalia, and the political process, now to be led by Ahmed, has been dislocated from the country, now based in neighboring Djibouti. Somalia has become a haven for piracy in recent months, and the World Food Program was forced to halt shipments to the country due to insecurity.